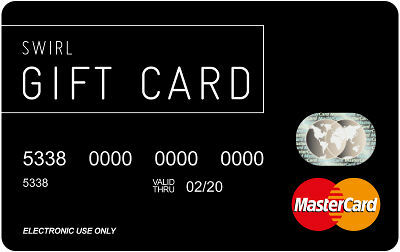 How does the Swirl MasterCard Gift work? Available across Ireland, Swirl Gift Card is great as a present for Christmas, Weddings, Birthdays, Kids, Corporate, Valentine's Day, Mother's Day - the list is endless. Swirl gift is accepted at all online shops, all airlines, all stores that accept MasterCard including Amazon, ebay, Smyths Toys, iTunes, Sports Direct, Ryanair, Aer Lingus, Argos, Penneys, Boots, TK Maxx, Littlewoods and 30 million more!! "It was so easy, just pick the Swirl gift card up in my local Spar and I put €100 on it for a last minute Christmas gift for my nephew. He had great fun using it on his PlayStation. "Really found the store cards and shopping centre gift cards very restrictive, I like the freedom of being able to shop online, locally or when I'm travelling. It's a more flexible gift"
"My brother moved to Australia a couple of years ago and it's great to send a gift that my niece can use in their local neighbourhood"
"A 2014 survey from online retailer Rakuten showed almost three out of four people won't like the gifts they receive this season. Let's do some quick Moneyball here: Based on these two studies, most gifts have a 25% approval rating, while gift cards have a 37% approval rating. Gee, I wonder which one I should pick..."
Gift cards tend to have a bad reputation, perhaps because the receiver thinks they are too impersonal. But I would much rather get a gift card (or cash) than something I can't use or clothing that doesn't fit. There's nothing worse than having to return a gift. Not only can it be a hassle, but it's also difficult to explain to your aunt why you aren't wearing that argyle sweater vest she gave you for Christmas. If you are looking for that perfect gift, here are a five reasons gift cards can make life easier for you and the person receiving.